In a 9 December press release, Crisil Research found that highway projects awarded in the fiscal year 2013-14 are showing “a sharp pick-up in execution amid a pro-active government and faster approvals by implementing agencies”. While this may be true of those 16 projects, it has yet to translate into an acceleration in the road building programme of the National Highway Authority of India (NHAI). 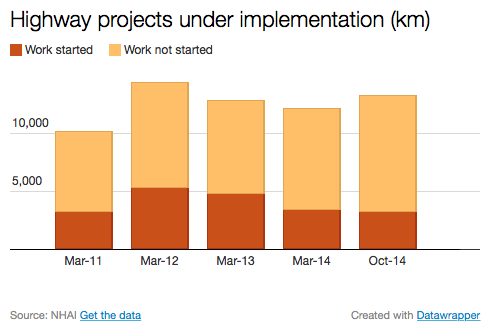 The data show that highway construction has slowed in the 2014-15 fiscal year beginning in April 2014, and been particularly slow since the Prime Minister Narendra Modi took office in May 2014. 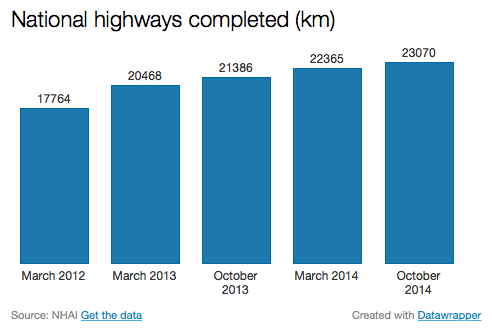 Between April and October 2014, 705 km of highways were completed, down 23% from the same period in the previous year. This translates into a daily rate of 3.3 km, down from 4.3 km the previous year. If we look at the period in which the Modi government has been in power for which data are available (June-October 2014), the daily rate is 3 km per day, 40% lower than what the United Progressive Alliance (UPA) recorded between April 2013 and May 2014. What about the implementation of incomplete highway projects? One of the complaints against the UPA was that road projects that had been awarded were failing to get off the ground because of red tape and financial difficulties. 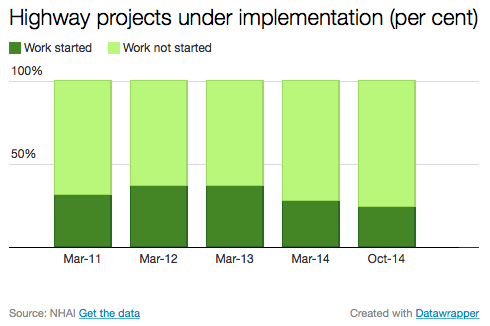 The chart above shows that the number of highway projects under actual implementation has fallen since March 2012 and remained low. In fact, since the Modi government was sworn in the number of road projects where work is underway has dropped a tad from 3,254 (in May 2014) to 3,213 (in October 2014), while the number of projects in which work is waiting to start has gone up from 9,442 to 9,984. The following chart shows this in percentage terms. To be fair, it is too early to judge the Modi government’s infrastructure building record. Land acquisition remains challenging, bank loans are still expensive and infrastructure developers have a lot of debt to pay off before they are able to invest afresh. Some will no doubt argue that many of these problems are inherited. But for now let’s go with Arun Shourie: “When all is said and done, more is said than done”.